Smart manufacturers can maximize their workholding investment by learning how to use these devices efficiently and to the full extent of their capacity. Drewco provides important tips. 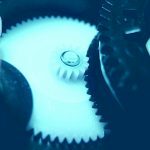 Like most manufactures, gear manufacturers today find themselves with the challenge of maintaining viability, maximizing profits, and enhancing productivity. Most are also experiencing varying states of budgetary constraints. Whether you have no budget, or some form of a limited budget, the takeaway from the current economic situation is clear. 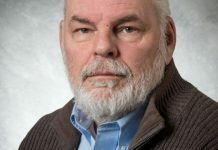 It is the old adage “make the most of what you have.” Low- or no-cost solutions and innovations play a vital role in improving agility and sustaining a competitive strategy. 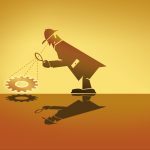 We now continually hear the lament from engineers and production managers that are asked to improve production without significant spending, and to do it quickly. In many situations an answer can be found in low-cost workholding solutions. Improving workholding can now generate significant cost savings. 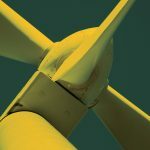 You often don’t have to make major capital expenditures, buy new machines, or redesign whole processes to increase production and reduce costs. 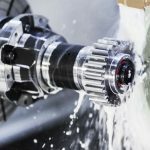 In a booming economy the vital role of workholding is often lost in the activity of new cell development, or inside the process of major capital expenditure of new machines. When these activities produce satisfactory results, the refinement and added significance of well-designed workholding can often be lost or become an afterthought. We have even had several customers who, in the complicated process of selecting and purchasing new machine, have forgotten to order workholding. 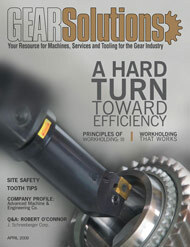 But right now workholding can become the resource that makes the difference that gear manufacturers need. Workholding can address productivity and profitability, representing low-cost actions can make real improvements. All workholding suppliers would like to be designing and manufacturing shiny new workholding components. 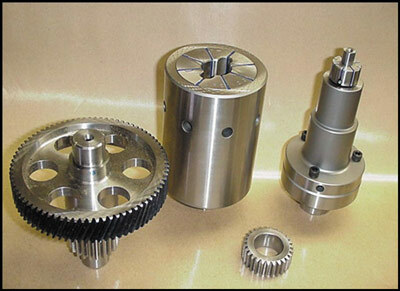 Currently, however, helping gear manufacturing customers make the most of what they have may in many cases be just what the doctor ordered, and how the workholding industry can be of the best service to its gear customers. 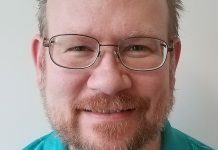 Where can workholding help? When design enhancements, refurbishing, protection, and planning are implemented, workholding can go a long way toward create big returns with the least cost and lead times. 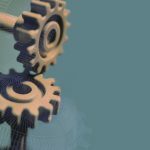 Without major manufacturing budgets, opportunities to refine and maximize the current processes still abound. 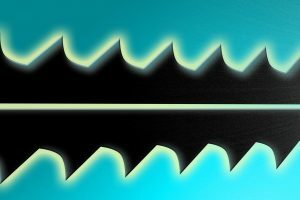 Design enhancements include changes that either improve setup and/or run time, or provide changes that adjust for any current issues or deficiencies. 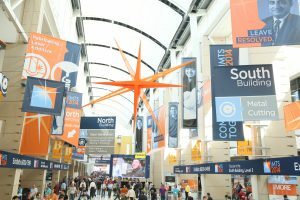 Design enhancements encompass several options. Existing fixtures can be recycled to machine new parts, or new parts can be added to existing fixtures. 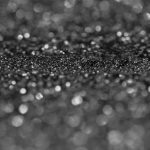 Additionally, the life of collets, chucks, and components can be significantly improved by changing materials, heat treating, web design, and over-travel protection. One way of increasing capacity is by changing the part holding method; for example, changing from multiple large dedicated part supports to movable supports has proven to reduce setup time by 88 percent. This kind of change in part-holding method also increases quality by reducing operator error and adds floor space by reducing storage requirements. Another would be to expand the family of parts being held. Workholding should always be designed initially to provide for future part additions or variations. 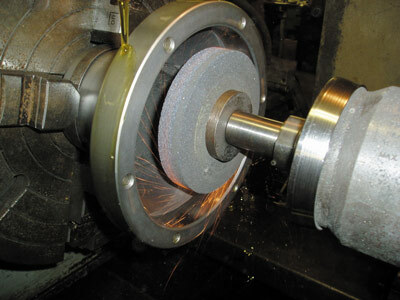 Conservatively, more than 50 percent of all hobbing and grinding workholding fixtures have the inherent capacity to handle additional part sizes. Expanding the family of parts that your workholding fixtures hold is, of course, one of the most effective ways to inexpensively improve production capacity (see Figure 1). 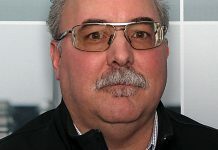 To look at expanding the range of parts that can be run on existing fixtures, two areas will need to be considered: machine capacity, and current fixture flexibility. 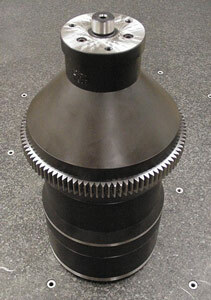 The parts to be added to the fixture will be examined for pitch diameter, helical angle, bore size, and face widths. Many times a few minor changes to the existing fixture can improve the fixture and allow faster changeover of existing and new parts. As an example, we were recently asked to add 22 more gears to a fixture we’d originally designed for 120 parts. 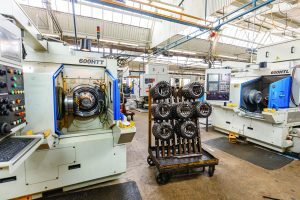 With the addition of seven more collets the customer gained 20 percent more machine capacity. 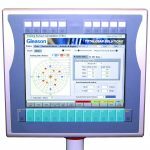 You can also have your quick-change fixtures multitask by making them interchangeable between machines, adding or redesigning universal bases into the fixtures. 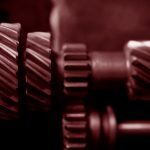 Most gear manufacturers have demand for short runs, and in this economy that demand has increased. Retrofitting fixtures with universal bases and quick-change features inexpensively adds agility (see Figure 2). 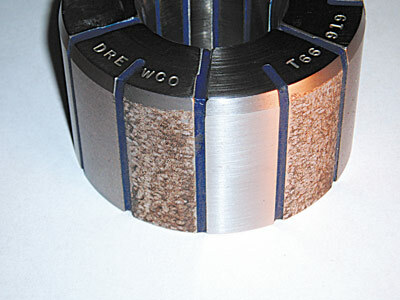 In addition, you can color-code exchangeable workholding components to increase setup speed and reduce operator error. Operators are under even more time constraints now. 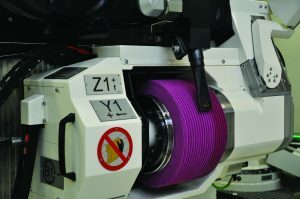 The no-cost color-coding of collets to match parts or part families reduces costly errors and saves both parts and tooling (see Figure 3). What in a different economy may have seemed like tweaking can now make a much-needed difference. Small enhancements to tooling improve operator speed and ergonomic comfort; e.g. access to activation screws, anti-rotation pins, machine orientation, and other limiting factors. Design enhances can facilitate the profitable moves to improved processes. The important switch to the dry hob process can be facilitated with new rigid workholding and tooling. 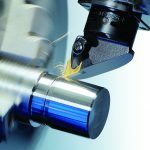 We have seen our customers get 62-percent more parts production between tool sharpening and at least a 25-percent improvement in cycle time. They also enjoyed the benefits of a cleaner environment (Figure 4). Adding clamping as close to the pitch line as possible allows for increased gear teeth cutting speeds through improved workholding rigidity. 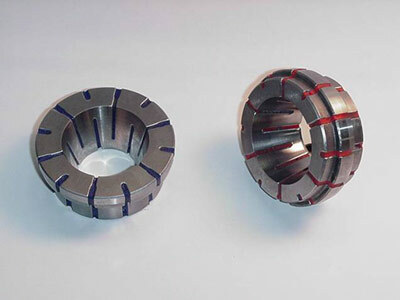 Reducing the amount of clearance required between the grip diameter and the relaxed state of the collet can reduce costs through extending the life of collets. 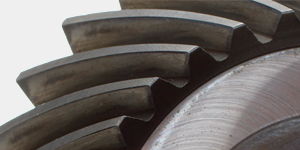 The total distance that a collet travels can be broken into three zones: load clearance, grip tolerance, and amount of over-travel. Historically, with manually loaded workholding, the amount of load clearance was kept at a minimum. With automated loading systems, however, the amount of load clearance required has increased. This moves the gripping diameter toward the other end of the travel, where the internal stresses reach a maximum. Adding a lead to the end of the collet helps to guide the workpiece over the collet. This, combined with a more-stringent setup of the automation, can help make this a reality. 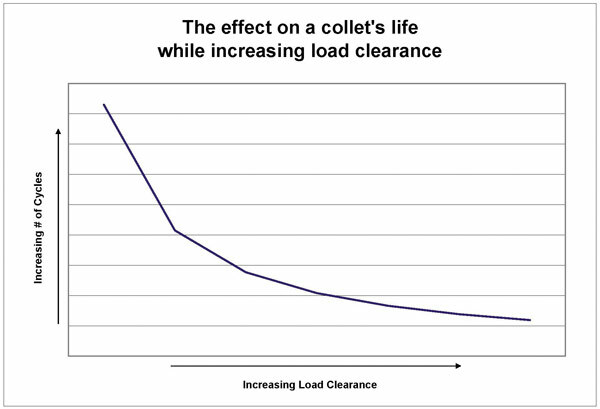 We have seen customers reduce the amount of load clearance and gain collet life that is doubled, tripled, and more by creating these minor change (Figure 5). Processing gears by machining the finished bore first is more cost effective than trying to finish the bore while locating off of the pitch line. 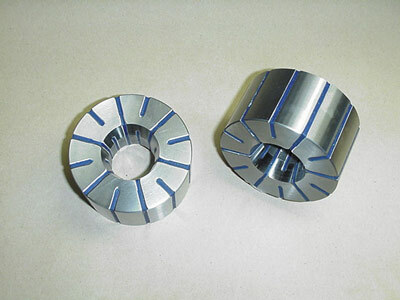 Changing to a collet fixture, which is more forgiving to tight tolerances, generates cost reductions. Finally, when it comes to design enhancements, communication is king. Communication is vital to getting it right the first time, and it is also imperative when it comes to improving on a current process. At Drewco we favor a quote from business author Ken Blanchard: “None of us is as smart as all of us.” Workholding experts have seen hundreds of design issues, and they have developed as many solutions through design or manufacturing methods—many at very little cost. Be sure to ask for a consultation and share your thoughts, issues, and goals fully. Issues that may not seem fixable, or ones that you just live with, can actually have a very workable solution. Whether it is a smaller interchangeable component, whole chucks, or a machining center fixture, refurbishing is a relatively inexpensive way to improve tooling function while also improving tooling life and its function (see Figure 6, Figure 7). 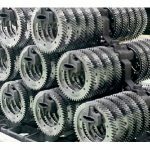 In addition, manufacturing firms are often unaware that they can extend the life of workholding that, in a more progressive economy, would be considered perishable. So don’t throw it out, refurbish it! 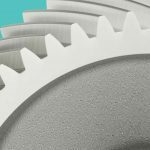 Manufacturers using worn fixturing often reduce their speed to avoid runout and preserve quality, driving production costs up. 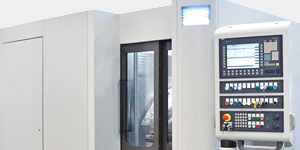 Refurbishing tooling, from collets to whole fixtures, can double the tool life. 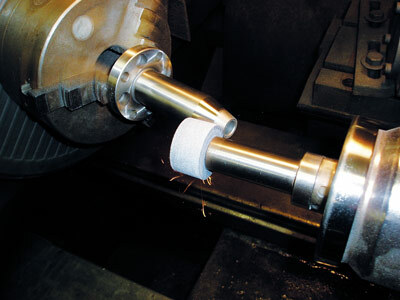 Collets: Sometimes referred to as bushings or sleeves, collets that are sealed or bonded can, over time or with certain coolants, become brittle and lose their elasticity. This can directly affect the ability to hold tolerances, and these collets are often disposed of. Many people don’t know that collets can be resealed for a fraction of the cost of new ones. Resealing collets will extend its life while also protecting the arbor or other tooling from premature failure. 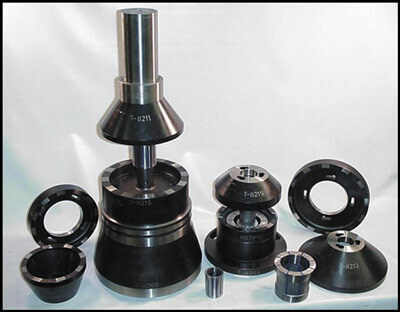 In the process of having your workholding supplier reseal your collets, the collet runout and concentricity should also be reconfirmed, insuring maximum tooling performance. Arbors and mandrels: Over time arbors, mandrels, and collets become worn and develop runout or lose the ability to grip the parts correctly. Runout not only negatively effects spindle time, but it also increases setup time and affects part quality. Arbors, mandrels, and collets can be reground or chrome plated and then reground. 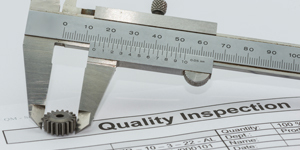 This process will return the components to like-new condition. Small costs that will reduce set up time and improve both production and profitability. 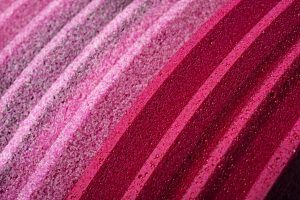 Applying an abrasive coating to the gripping surface of fixturing can increase wear resistance and transmit more driving force to the part, reducing slippage and improving performance (Figure 8). 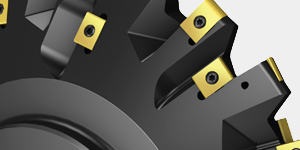 Out-of-tolerance hydraulic arbors can be unassembled and have only the worn parts replaced. In addition, hydraulic arbors that no longer expand can often be repaired by replacing seals and recharging. • Clean fixtures after use. This sounds simple, but it’s the single most important part of maintenance. • Lubricate fixtures after cleaning. This will prevent rusting, as well as allowing smooth operation of the fixture. • Store collets in lined drawer or containers. Avoid letting them roll around or knock up against each other. • Take care not to drop collets. If a collet is dropped it should be visually checked to be sure it is not cracked or bent, and then checked for runout at installation. • Reduce operator error by marking collets clearly. Consider color coding collets and posting laminated instructions for chuck assembly and part loading. • Examine collets regularly for wear, and reseal when necessary. • And, of course, never activate a collet fixture without a part in the fixture. There are some experts who believe that when the economy recovers it will do so rapidly. Even if the overall recovery is not rapid, depleted inventories will need to be replenished across the board. 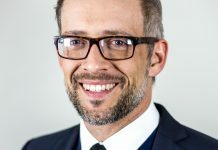 Demand will increase, and the manufacturer who can respond quickly will pick up market share from the suppliers that haven’t remained forward thinking. Our large OEM customers are telling us that when the economic landscape improves they expect things to get hot and hectic, and we will all be expected to respond accordingly. Future planning to maximize capacity and growth at the end of the current economic tunnel is essential. 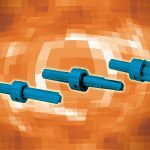 Taking stock now, and planning capital expenditures to dovetail with lean-type processes such as reducing batch sizes and shortening lead times, will allow suppliers to seize upcoming opportunities. Planning now for workholding that is interchangeable, versatile, and expandable will provide the production agility that will be even more important in the recovery.